comfortable clean accomodation. Very friendly reception. Definately will be returning later in year! Third time I've stayed here and each visit has been exactly what is needed. No fuss - great wifi - clean room - comfortable bed - good shower and excellent breakfast. What more could anyone want. Good beds. Clean. Great breakfast. Nice owners. Welcomed warmly by Helen on arrival who ensured special dietary requirements were met. Lovely clean and large room.I would stay here again. Brief one night stay to visit my son. Booked several weeks in advance. Friendly welcome to a clean and warm guest house. Pleasant breakfast and I was on my way again. Would happily recommend or re-visit. Great place, great value for money, everything clean and working and good breakfast in the morning. I have stayed here a few times and it has been consistently very good. The rooms are simple but comfortable and clean.Helen the owner is lovely and cooks a wonderful breakfast fresh to order every morning.I would recommend this B&B to anyone and I will be returning again! Very good location, very kindly staff and standard english breakfast! 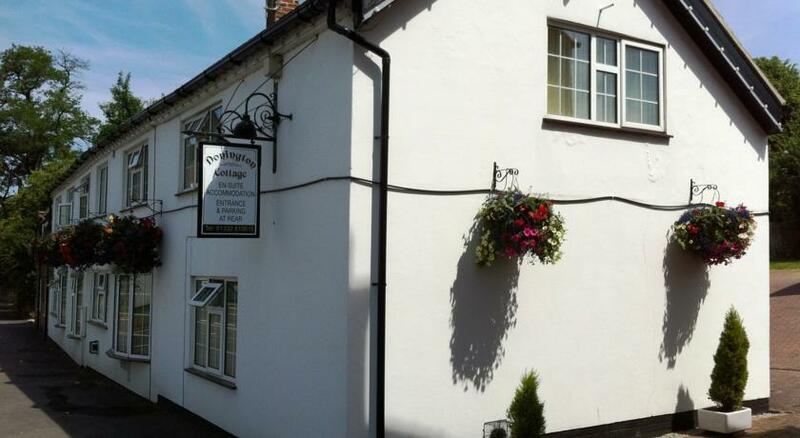 I had a fantastic experience with my stay at Donnington cottage guest house. It was my very first time travelling on my own having being recently widowed so therefore a bit apprehensive being alone but I was welcomed and really looked after. Will use it again with confidence. Great for the money. Very good breakfast. This is my third time to stay in the Donnington area and this has been the best location so far. Stayed with a number of friends and well pleased by the attention given by Helen and her excellent breakfast. Not 5 star, and doesn't pretend to be, but ticks all the boxes for me, warm, clean, friendly with good food and company and at a very reasonable cost. Will stay here again should the need arise and the Guest House available. Very comfortable stay. Good facilities, great breakfast, lovely personal service. A vety nice place to stay over and a really friendly lady! Regards, two Triumph-boys from Finland. Great cosy place with great breakfast and nice owners! Thank you! Thank you Jerzy, see you again next time you are in East Midlands Helen and thank very much for the chocolates what a lovely surprise. A friend and I stayed here for the classic bike weekend. The location is ideal and the cottage is really nice. We were made very welcome and Helen looked after us with a lovely breakfast. Will come again. Nice place to stay only problem was the noise from the airport, very friendly people good parking area. I stayed at Donnington Cottage for 5 nights. As the description says:easy to walk into town for some restaurants and pubs. Bus stop right in front of the B&B, convenient to hop on to go to the airport (less than 10 minutes). The rooms and the bathroom are clean, and the room has everything you need. The proprietor Helen is amazing, very kind, helpful and she does a great breakfast too! Thanks for the pleasant stay. A traditional 'no frills' B&B offering everything you need at a great price. Friendly hostess, spotlessly clean rooms, excellent breakfast, secure parking. We had a lovely time staying at the cottages,they were very clean the breakfast was excellent and Helen and Les are a very nice couple very attentive host's. Would highly recommend. Stayed for a short weekend break in a room with en suite, excellent place and the breakfast was lovely too. Helen and Les were brilliant hosts and nothing was too much trouble. Would recommend Donnngton Cottages in an instant.Thank you both for making our stay a lovely experience.Marty &Alan. What a wonderful place to stay. Spotlessly clean, very friendly and breakfast was delicious.We will come again. As seasoned travellers we were a little disappointed with the accommodation for the price we paid. The proprietors met us with a warm greeting but rooms turned out to be quite basic, the beds were uncomfortable so subsequently we didn't have a particularly good nights sleep there was a total lack of brown sugar or any form of sweetner as an alternative in the room. Although we chose not to have the full cooked breakfast we were expecting a bit more than we got, my wife had sausage and scrambled egg, 2 small sausage and a small portion of quite sloppy egg, my son had sausage and beans, again 2 small sausages and a small portion of beans and I had bacon and scrambled egg, 2 rashers of bacon and a smallportion of sloppy egg, the toast was plentiful however. Stayed 2 nights. Is only about 5 mins from the circuit so very convenient if you’re racing or spectating. Good choice of breakfast, ample parking and the hosts are very accommodating. I had the single room upstairs which became very hot as I believe the boiler is behind a wall in that room. Not sure. Very noisy with windows open but if you want something quieter then you need something out of town. Would book again. Perfect location for Download and if you can't manage the 1.2 mile walk, there's a bus stop outside. Breakfast was excellent as was hostess Helen.Nothing was too much trouble.Very friendly atmosphere.Would definitely stay there again - if there's space! Donington Cottage has never disappointed, and I have stayed there many times. Clean and well presented accommodation;amazing breakfast;on-site parking;close to both Donington Park circuit;walking distance from restaurants etc;and fantastic owners. All for a very favourable tariff. Could’nt recommend more highly. This was my 3rd or 4th stay here as I come for the Karting Grand Prix each year.Warm welcome, clean room and lovely breakfast.Room was well equipped in terms of tea/coffee making facilities. Very helpful and accommodating, Very clean rooms and a great location. We would definitely visit again. Absolutely perfect for the second year running. This year we were a group of seven all staying at Donington Cottages from Spain, Holland, Belgium and the u.k. Caould not fault the accomadation, breakfasts and host. Hope to return again next year. Had a lovely 2 night stay as we were visiting Grand Prix Museum. Breakfast generous and plenty of choice. Comfy bed and clean room. Helen was friendly and interested in our visit. Two good meals out at The Castle and the Nags Head. Would stay again if in the area. Having had a brilliant day at the nearby Donington Park race track it was lovely to be able to relax and enjoy an overnight stay, rather than battle with the rush hour traffic on the motorway. Helen made us very welcome and the room was clean and comfortable. We would certainly stay here again if in the area.Thank you for the Nag's Head recommendation - we had an excellent meal there. Very clean, warm and accommodating (I was arriving late but no problem to 'Helen' the owner. )Superb breakfast - just right! Very pleasant, warm, extremely clean with a good breakfast as well!Easy from the M1 (when the road works have been completed at J24!! );this is great value and a gem of a small hotel! the landlady was very attentive and the breakfast was excellent would stay again if opportunity arose. Really convenient for Donington circuit where I was for a couple of days, with everything I needed and nothing I didn't for a good price which included a great breakfast. A very pleasant stay at the Donington Cottage, friendly welcome and nice and tidy. Very much recommended. Plus a good feed for breakfast :). I have stayed with Helen over several years it's very comfortable,super breakfast and excellent location for the village and transport links.If you've a car plenty of space and the accommodation is immaculate! The guest house is well situated for Donington race track. The rooms are a bit on the small side, especially when set-up as a twin. That said the beds are comfortable, the welcome friendly and the breakfast more than ample. There is also a good pub within 5 mins walk for evening meals. Our room was immaculate and very well equipped. The owner Helen was very nice and cooked a delicious breakfast. Friendly hosts, clean room good noise insulation.Breakfast excellent. Perfect location for Donington park circuit with private parking at the rear. Good breakfast. Ensure you contact them if you have a trailer so they can reserve a space for you. All great as usual. I come back every year as Donnington Cottage is very handy for the airpot and sp much more pleasant than chaon hotels. Highly recommended. Comfortable, friendly and met the description.Great breakfast and the opportunities for evening food are really good. We were going to a wedding at Donington Hall about a mile away, This guest house was perfectly positioned for us. Very comfy beds, extremely clean and very welcoming. Breakfast fab. Many thanks to Helen and partner plus Fergus the dog. I had a very pleasant experience from being greeted by Helen all the way through to a great breakfast. the only negative was some road noise which ceased after 9:30 pm. Lovely place to stay very close to airport will stay again if i fly from east midlands good value for money. I have stayed here a few times now and have always found it to be the nicest place that I have stayed.Good value for money, very clean and tidy.Helen the hostess is very friendly and welcoming. Lovely place in good location. Made to feel very welcome as soon as we arrived. Breakfast was lovely. Would definatly stay again. As always, we found Donington Cottage clean and cosy combined with personal attention from Helen, the friendly proprietor. Despite late arrival and early departure the Doningtons Cottage hosts are very adaptive and make the stay easy. The place is cosy, rooms are quiet, very clean and comfortable. Convenient location very close to bus stop to the airport and Main Street restaurants and pubs.Highly recommended for any kind of stay in Castle Donington or a trip by East Midlands airport. Accommodation is very comfortable and good value.The breakfast is excellent and sets you up for the day.My only problem was that there were no toiletries in the room and I hadn't brought any with me as it said they were provided.Perhaps I should have seen you about it but I didn't wish to bother you.Stayed here for 2 consecutive years and hope to continue to do so. Room was compact but pleasant and very clean with all I wanted for my brief stay. Breakfast was excellent and proprietors were pleasant and helpful. Even texted me when I left my phone charger behind, so I was able to get back to collect it before leaving the area! We really enjoyed our stay really goodbreakfast nothing too much trouble. This Guest house is one of the best that i have been too. The accommodation was immaculate, practical and comfortable. It is only a short walk from places to eat and also close to the east midlands airport and donington race circuit. Would highly recommend to other people. Helen, who runs the establishment is very friendly and helpful. Her hospitality is impeccable. Stayed one night in a comfortable bed, nice layout of property, very clean and lovely breakfast which in spite of best intentions not to eat all of it, I couldn't help myself! Helen is no fuss and very sweet. Ate at the Castle and the food, ambience and establishment was extremely high standard. Would definitely stay again. A great stay at Donington Cottage, very friendly, great breakfast and great value. A warm welcome and very friendly lady filling in for owners who were on holiday. The B&B was ideal for what we required.Helen was very welcoming and offered to cook us a breakfast the next day for 06.30 due to our early start. The rooms were tidy and warm and we had a good nights rest.Will come here again. Friendly and helpful owner;clean and comfortable accommodation. Helen is happy to provide breakfast at 7am, so you will be well in time to sign on for trackdays at Donington Park, which is only two minutes away. Excellent value and a great breakfast. Thank you Helen, see you again sometime. Perfect setting close to the track.Very welcoming and hospitable. Great gastro pub just up the roadWill definitely stay again. Comfy bed, great location for East Midlands airport. Excellent English breakfast. Good value. Helen is lovely and very attentive. Highly recommended. Friendly owner,good location, comfortable room, great breakfast. Just what was needed before a long day at the circuit. This B&B is neat cosy and comfortable, with nice and very adaptive owners. Very good and personalised breakfast. Strongly recommended for its quality and location. Great stay at Donington Cottage- lovely roomand top class breakfast. Lovely old character cottage and nice village. Thankyou. Enjoyed our stay very much, Helen was great so was our breakfast and room. Would definitely stay again. Very comfortable roomVery friendly host. A very welcoming place to stay where I would not have a problems in recommending to anyone.I hope that when I next visit the area there will be a room available for me! the rooms are spacious,very comfortable and clean.In fact the whole guest house is the same,and the breakfast is excellent.I have stayed here on a number of occasions and will continue to do so. Just had a3 night stay at this wonderful guesthouse. Mine hosts Helen and Les were excellent. Breakfast was plentiful, the room was spotless. Five minutes from Donnigton circuit. Looking forward to going back next year. Stayed over for one night after visiting Donington Park. Can't fault anything about the Donington Cottage &I will be staying again. Warm, clean and comfortable with a friendly proprietor and a feast of a breakfast!An easy 5* recommendation. Stayed here on December 17 last.EXCELLENT value for the solo traveller, comfortable ,warm and clean. Best breakfast i had during my 4 days in U.K. .Helen very helpfull with all queries,nothing too much trouble.Stay in Donnington Cottage and you will realise what you are missing when staying in Motels and Inns ! Great breakfasts, very comfortable stay. good place to stay, the guest kitchen and secure parking was particularly helpful. Excellent breakfast. Lovely clean room. Warn welcome. Great breakfast. Ideal accommodation for Donington Park and East Midlands airport. Basic but very comfortable and good breakfast. Friendly and helpful service. Happy to recommend. We stayed one night at Donington Cottage, sharing a room with our son. It was very friendly and clean, and the cooked breakfast was lovely. Nice higgledy piggledy building with shared bathrooms. Good price, very clean , wonderful sleep , plenty parking and friendly owners and awesome breakfast! Would stay again when in the area. Run by nice owner, good way to stay in Donington Castle - good beds, clean and some good restaurants nearby. A more than decent stay at this comfortable guest house in pretty Castle Donington. Ihad to change my initial booking, and was also grateful for Les's help in rescheduling it without penalty or fuss. Single room was fine, as were bathroom facilities and a satisfying cooked breakfast, made by Maggie.Only one or two minor gripes/suggestions - a washbaisin in the bedroom would be a welcome addition, and more clarity about whether payment is taken on the emailed booking receipt could be helpful. Otherwise, I'd be perfectly happy to stay here again. My first time at this pleasant guest house.Spotlessly clean. Made to feel really welcome even though i was late in arriving. Great breakfast and fantastic value for money. Definitely stay again. Good location close to airport.very clean and comfortable room.I will definately stay there again. Prior to our arrival I received a nice e-mail from the owner. We arrived at 9.30 to be met in the car park by the owner. We did not expect our rooms to be ready but was given the key to one of the rooms which was in fact ready. The rooms (2 Twins) were basic with beds and a TV (what more do you want) Breakfast in the morning was fantastic, plenty of coffee and toast and a full English. We are waiting for next years dates for the BSB and will be straight on to book. Stayed for 2 nights for visit to BSB meeting at Donington Park. Were made to feel very welcome, room was very clean and very nice breakfast. Clean room , comfy bed , nice breakfast , parking and a short walk from restaurants , this good value B&B is ideally located for the Donington circuit. Looking for a base for a couple of nights, for visiting heritage railways, found this. Donington Cottage Guest House is very comfortable, has exactly what you need and although it is next to the road and very near East Midlands Airport I slept with the window open and was not disturbed. Good choice of pubs and restaurants in Castle Donington, all within easy walking distance.Only slight gripe was cereals! Hate cornflakes, Weetabix etc, most places have a muesli option. Still five stars though! Great - comfy, warm, welcoming, will use again....and very close to circuit.Thank you, Helen! Rooms have all anyone needs for a short stay and are clean. Ideally placed for Donington. Breakfasts are great. Quaint place. Close to pubs but quiet. Safe parking. Friendly staff.Hope to visit again. Lovely place;kind, friendly owners;free wifi;lovely breakfast;clean, pleasant room;decent value for money. Great value will use again thank you. I stayed in a single room with shared bathroom and no problems at all sharing these facilities. Comfortable bed and great breakfast. Fantastic Wi-Fi. Conveniently located for the airport. No problems with out of hours arrival. Would definitely return. We had a very comfortable stay at this guest house.Rooms clean and bed well suited for a good night's sleep. Location favourable for the village centre and race track. No problem with traffic or airport noise.Very friendly and helpful hosts and tasty breakfast. Very comfortable, clean, friendly and a smashing breakfast. I spent a very comfortable night at Donnington Cottage,Extremely convenient for the airport. Comfortable room. Clean bathroom and toilet. Owner is very helpful. Nice breakfast. Good position -ideal for airport. I was welcomed later in the evening and shown around. Nice clean rooms and very close to donnington park. We had such a lovely stay at short notice. The pictures don't do the place justice, it was beautiful and so clean. Everyone was so lovely it was like a home away from home. Thank you!! Was made very welcome. Room clean and comfortable. A good vegetarian breakfast. Very comfortable bed, all very clean and a wonderful full English breakfast to start the day. Comfortable room but slightly noisy due to traffic.Good teamaking facilities and excellent breakfast.Had everything you would need and was very reasonably priced. Lovely place to stayHelen was very welcoming and helpful. Breakfadt was exceptional.Woulddefinitely stay again. second time we have stayed here will stay again room clean and comfortable Helen the owner very friendly and helpful cooks a breakfast to die for a good start for the day. Donington Cottage is a very good Guest House and provides its guests with a high quality stay. I would certainly return again. We chose Donington Cottage as it was close to Donington Race Circuit and as it turns out we chose well;it is a delightful and friendly guest house, beds were super comfy too!I would recommend this guest house to anyone. stayed at cottage for two nights in april we were there to watch the touring cars at donnington great place 3 of us in the family room,warm cosy,good beds good bathroom , good breakfast lovely people well looked after by hellen the boss, would stay again no prolem ernie hunter. I made this booking on behalf of a contractor and I have not heard any negative reports from him. Just right for my purposes.Clean, tidy, quiet, warm, everything worked, good breakfast at 7am.Guest kitchen that I did't need this time but a useful extra.Shared bathroom had a large walk in shower, also perfect for me.Good off road parking. Thank you very much indeed for the wonderful, warm hospitality, and for your flexibility in allowing me to check in a bit earlier than normal, but still serving me a most delicious breakfast on my arrival when it was past the usual time for breakfasts, much appreciated ! After staying in Hotels every week in the local area for the last two years,after receiving a recommendation from a local pub - and reading all the good reviews,I took the plunge.Helen was on holiday so didn't have the pleasure of meeting her.Clean/Tidy/Warm and Welcoming and probably more ideal for someone getting an early flight from EMA or at a local course/working away for a few days.Additional kitchen you can use was useful.The room was very small - bed comfy - but ensuite was very difficult to get to grips with if you are more than a size 10.I personally couldn't use the toilet as I either burnt myself on the towel rail,or couldn't fit comfortably with my shoulder on the shower cubicle and knee on the towel rail (after switching off) I might add.Think clients should be advised prior to booking of the small size of the area housing the toilet - more suited to a child/teenager. We would like to say how good it was to stay there. You had a good feeling as soon as you went into the place. The place was nice and clean and comfortable. Helen the lady who runs the place is very friendly. The breakfast was good also. Wonderful guest house and friendly staff. Room very comfortable, great breakfast and plenty of parking. Will definitely use this again. I stayed one night during a weekend course. They were very welcoming,and the room was spotless. The bathrooms aee shared,but again very clean. Breakfast was lovely. Overall a very nice night, very good value for money. Thank you very much for your review. Im pleased you enjoyed your stay with us.Helen. Nice stay but bedroom just too small for two people would want a bigger room with ensuite if we stayed again. We stayed overnight when son was racing at Donington Racetrack very warm and comfortable room. Breakfast was amazing a good start for the day. We found the Guest House to be clean and comfortable. Helen was a lovely host and made us feel at home. The only thing that would stop us from recommending the Guest House was that it is on a busy road and the noise from the traffic was loud. Perfect B&B in a great location. Made to feel at home straightaway by Helen and the rooms were spotlessly clean. Great breakfasts and Helen was very attentive making sure we had plenty of everything. Nothing was too much trouble and were very helpful getting boarding passes printed off. We will definitely be back. There is much to praise. Great location, easy off-road parking. Warm and friendly reception from Helen, clean room and bathrooms and an excellent breakfast. Full English and plenty of it. You will enjoy your stay.Struggled to get wi-fi and shared bathroom stops the full 5 Stars. Although our room was on the ground floor facing the road it was well sound-proofed so noise was not a problem. It was also very comfortable. Helen is a lovely hostess and she could not have been more friendly, welcoming or helpful. The breakfast was excellent. Very comfortable, owners are really kind and prepare a special English breakfast.I will book again for my next trip. Traveled down for the night before a festival to save travelling on the day and had a very relaxing time. Helen is polite, helpful and accommodating, and the room was clean and cosy. The breakfast was also very good and I'd recommend getting this included. Thank you for everything! I actually called Helen to cancel my booking as i mistakenly booked a room that didnt have an en suit.But Helen was so nice I kept the booking.The Guest house was lovely and cosy, very clean and safe.There were even toiletries in the bathroom with lovely thick bath mats!!! Only stayed one night, we found the room comfortable, shared bathroom clean and tidy, breakfast was very good Helen was very welcoming, would use this guest house again. Very nice stay in the cottage. I'm an American traveller that likes to stay outside of the chain hotels and business corporations. Lovely family that runs it, ample parking, clean facilities, and wonderful breakfast. absolutely disgusted in the service. we came and was told you hadn't received our booking and therefore had to go elsewhere. Whats even worse is you have the audacity to send me an email asking how the stay was! Good bed and good breakfast, enjoyed my stay here, useful place to stay on a work trip. Comfy , friendly, bus stop in front and great breakfast.I arrived late for check in and Helen helped me.This will be my place every time I go to East Midlands. Thanks Juan nice to meet you glad you enjoyed your stay, hopefully see you next time you are in Castle Donington. Will be staying here again as found it warm and friendly. I usually stay in ensuite accommodation only but it wasn't available for my stay. I would not hesitate to stay and share the shower rooms again. Great surprise to find a kitchenette available to guests for storing grocery items and cleaning out the cooler! Beautiful back garden! Very clean comfortable accommodation! Lovely little guest house,very clean and tidy, everything I needed was at hand and made to feel very welcome!Would return and would recommend.Thank you for a lovely stay. Great b&b. Very comfortable, friendly and an awesome breakfast in the morning. Would very happily stay here again. Pleasant digs for my week at a training course at Donington park, all I needed was a warm place to sleep, shower &do my homework which Donington cottage supplied without problem.To have use of a kitchen in the evening &a garage to keep my motorcycle in were above &beyond expectation.All in all, my needs satisfied. Just like to say I really enjoyed my time there even though just for 1 night, but if that's the standard I'd would stay there longer next time without a doubt.Good clean honest guest house. Excellent value for money, thank you. Thank you for every thing you did for us during our stay.We enjoyed our stay at Donington Cottage we hope to be staying there again. so pleased we found you. t'was a most enjoyable stay, lovely breakfasts, super clean beds/ room. didnt want to take my face away from those lovely white sheets! perfect rooms, perfect hosts, perfect place! Stayed in donnington cottage on 2 separate occasions for 4 nights with work. B&B ideally located for the village and regular bus to airport. Owner Helen is very friendly and serves a fantastic breakfast. Rooms could probably do with a redecorate but are large spacious and comfortable with excellent wifi. Overall for £35 a night a very worthwhile choice, especially given some of the other options in the village. This is a West-country saying meaning that everything is fine and good. This is a little gem of a place with traditional values of courtesy and service. If you want plastic surroundings then this IS NOT the place for you, here you get proper wooden furnishings in a traditional cottage style. It has to be said that the cooked breakfast is to die for and Helen has to be congratulated on such a high standard,Stayed overnight whilst visiting friends. I only need a room for the night so I could catch my flight early next morning so I was not there long. Helen was wonderful showing me where I could get some breakfast before I left as my flight was very early. the room was very clean and comfortable. I will definitely return to Donington cottage on my next rip to the UK. Many Thanks Helen! Lovely clean room value for money. A very pleasant stay at the Donington Cottage. I will stay again very happily! Friendly welcome, comfortable stay, and very good breakfast. Top-notch. A friendly welcome combined with clean comfortable accomodation and a well cooked breakfast makes Donnington cottage a relaxing stay. The property looks well cared for and the hanging baskets surrounding the whole cottage are amazing.Owner Helen seems to prideherself on good customer service and our onlysuggestion would be to add a couple of veggie sausagesto the veggie full english ! A lovely cottage, with a lovely garden to sit in and read, as I did the afternoon before my flight from East Midlands. Set in a pretty village with a number of eating places within walking distance. Everything was clean and adequate for a stay. I particularly liked the fact that breakfast was available even though I had to leave at 5am, a taxi had been ordered for me on my arrival so I knew it had been done, and he was ready and waiting for me outside the door.I would stay again if flying from East Midlands. Lovely quiet and clean guest house with a personal touch. Plenty of parking, breakfast was freshly cooked and excellent. We would certainly stay at Donington Cottage again and wouldn't hesitate to recommend it. Excellent value for money. Secure parking for a motorcycle around the back. Comfy room and gut busting breakfast. Within easy reach of the village centre - look out for the micro-pub 'The Chequered Flag' in Church Street - Donnington Race Circuit and the World's largest collection of F1 cars. Friendly, welcoming and helpful.The room was ideal for its purposes.The breakfast, included in the cost, was tasty and filling.I cannot fault my stay.Would definitely stay again if circumstances warrant me working locally again. What a fine guest address! !We are four days spoiled every day a clean room, a clean towel and .... a lovely english breakfast. Here we have a newcomer definitely return. Thanks Helen and Les! Stayed 2 Nights . Good car park for bikes as well , Very Clean Room , Very Quiet , Brilliant Breakfast and felt much welcomed .. The room was cosy + had everything we needed. A useful touch was the Visitors Kitchen down the hall so we could prepare snacks prior to attending a wedding reception.Helen was very helpful giving us a local taxi card plus card for the b+b so we knew where to get back to!Breakfast was lovely with plenty of choice.Overall a really pleasant stay, thanks! Thank you so much for your kind remarks. Helenhope we might see you again somtime. After not having visited Donington Cottage for a few years, it was really good to return and to see that nothing had changed! A really welcoming place;everything clean and presentable;really convenient for Donington Park race circuit (well .. that wasn't going to change);and an amazing breakfast at a time that many other B&Bs would not be prepared to offer.Many thanks to Helen and her staff for keeping Donington Cottage just as it always was.A really great place to stay, and one that is always top of my list when visiting the circuit. Very enjoyable stay just for one night.Room very clean and tidy, plenty of space for two persons.Made very welcome, good breakfast provided.Would use again. I found the Guest House to be very comfortable, clean and friendly and would recommend it to my fellow marshals. I shall be back next year. Very friendly , very pleasant stay will be back soon , my only comment is the poor shower . Nice guesthouse made very welcome by the boss lady, great breakfast good for the hangover!! also very handy location for the race circit. will stay again. Very friendly people, room clean, bed comfortable, plenty of parking space, very handy for airport and despite it being firework night I found the room well soundproofed. I would definitely stay there again. Simplicity is often beautiful.A welcoming face and a hearty breakfast is all I needed and that's what you get here.I was met and left alone to do my thing within two minutes of arriving in the car park.An innovative and effective plug-in broadband solution in the basic functional room was the icing on the cake.Great value and everything you need for a good night's sleep before a track day.I will be using Donington Cottage again for my next stay. me and my daughter stayed at Donington Cottage on the 13/08/11 for one night. We found it very comfortable, clean and very friendly. The food and service was excellent. I will definately recommend and return. We only stayed in the guest house for one night as a convenient place to catch an early flight. The guest house was all we wanted and more - lovely clean room with en suite and good facilities, including LCD flat screen TV. The guest house was well equipped with a clean and practical kitchen, which we used and enjoyed a meal in the lovely garden! Helen was very kind and helpful and left a nice breakfast out for us as we had to get up early. I would highly recommend. Many thanks. We stopped at Donnington Cottage for 2 nights during a friends wedding weekend and dispite not spending much time in the room we where well looked after. The breakfast is the bit I always look forward to and it wasn't a disappoinment. A comfortable stay and good value too. Nice house with great breakfest service, only internet connection could be better. Next time I will take my own LAN internet cabel with me. All very satisfactory and friendly and free from external noise. Had a really nice stay.